Known as the Land of Smiles and the perfect place for an adventure on this 10-night small group tour. One of the most popular destinations in Southeast Asia, and for good reason - picture golden temples and bustling cities, forested mountains dotted with waterfalls, ancient archaeological sites and rice paddies bisected by winding rivers. 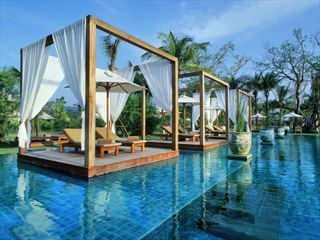 You’ll experience all that and more during this diverse 10-night introduction to Thailand. 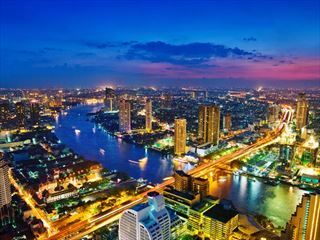 The tour begins in the frantic capital Bangkok and heads north to temple-studded Chiang Mai, to the ruins of Sukhothai and the peaceful countryside town of Kanchanaburi. You’ll also get the chance to learn about the country’s infamous Death Railway and take a historic train ride across the Bridge over the River Kwai. 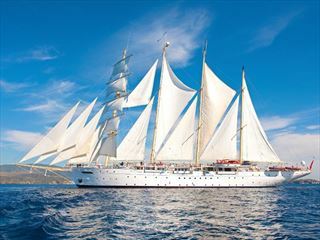 This trip is perfect for culture, history, adventure and nature lovers. (INT - TTKK). Take a Thai cooking class in Chiang Mai. Cycle around the ancient temples and ruins of Sukhothai. Visit Kanchanburi’s Bridge over the River Kwai and learn about the Death Railway. Travel like the locals on an overnight sleeper train. Welcome to the Land of Smiles! Your trip begins with a transfer to your hotel and welcome meeting at 6pm. If you arrive early, take the chance to explore the city. Wander down to perhaps the world’s most famous backpacker street, Khao San Road, where you can sample some street food or take a trip into sprawling Chinatown. Optional activities include a Tuk Tuk or cycling tour for an additional cost. Today you’ll delve into Thailand’s chaotic capital, starting with a cruise down the Chao Phraya River. Take in the city’s sights from the water and sail along the maze-like khlongs (canals). Back on land, you’ll visit the famous Grand Palace, which was once home to Thai royalty and boasts a collection of ornate temples, statues and gardens. A highlight is Wat Phra Kaew, the most sacred Buddhist temple in the country which houses the Emerald Buddha. Take the rest of the afternoon to explore independently, relax, shop or have a traditional Thai Massage. In the evening, you’ll board the overnight train to the northern city Chiang Mai, which takes around 13 hours. Multi-share compartments have seats that convert into bunks and come with bedding. There’s a food and drink service, but bring your own snacks and some warm clothing as the air conditioning can be fierce. Wake up to lush countryside scenery outside the window. Chiang Mai is a cultural hub known for its art and culture scene, orange-robed monks and walled Old Town, which is surrounded by a moat. The city is dotted with over 300 stunning temples, you’ll take a trip up to the most impressive, Wat Phra That Doi Suthep, which sits on top of Suthep mountain and offers fantastic views over Chiang Mai. Walk up the 300-step staircase, guarded by dragon-like creatures called nagas, to the golden temple at the top where you can light some incense and listen to Buddhist monks chant. In the afternoon, you’re free to continue exploring independently. Stroll through the tree-lined streets and pop in and out of mosaic-covered temples, have a traditional massage or spa treatment or head out on a bike tour. In the evening, you’ll enjoy a traditional Khantoke dinner, a communal meal comprised of many small dishes served on a low table. You’ll be entertained by Akha, Yao, Lahu, H’mong, Lisu and Karen tribal dancers. Take a cooking course and learn how to make some classic Thai dishes such as Pad Thai and the northern Thai speciality, Kao Soy. Shop at the local market for ingredients with your guide, who’ll teach you how to create these tasty dishes and give you a recipe book to take home. After you’ve feasted on your creations for lunch, you’ll round off the meal with a seasonal fruit tasting. Spend the rest of the day soaking-in the city or relaxing by your hotel pool. 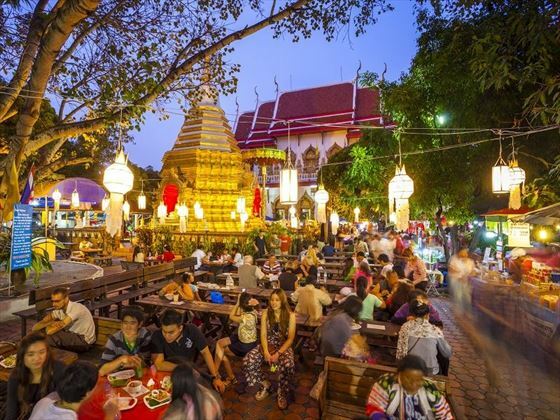 In the evening, why not take a trip to Chiang Mai’s popular Night Bazaar? Trawl through dozens of stalls selling everything from souveniers and handicrafts to clothes and street food. If you’re in town at the weekend, there’s a chance to visit the larger Saturday or Sunday night markets. A mini-van will take you on a 90-minute journey north to the H’mong Hilltribe Lodge, which is set in a forested valley surrounded by a mountain range. 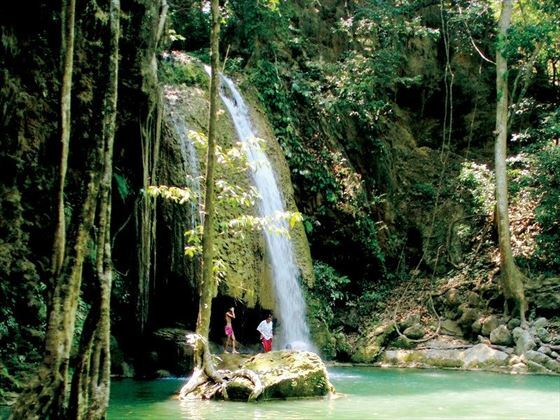 Take in the sights and sounds of the jungle, look out for wildlife and marvel at the misty mountain views. This traditional lodge belongs to the H’mong people, a Thai ethnic group who originated from Southern China. Rooms are simple and blend with the environment, including an open-air dining area where you’ll enjoy a barbeque dinner and watch a cultural performance which depicts a traditional wedding ceremony, makong (cotton ball) throwing and a shamanic ritual. Say goodbye to the jungle and make the two-hour trip to Lampang, meaning ‘horse carriage city’, which is one of the most unspoilt areas of Thailand. Here, you’ll visit Friends of the Asian Elephant Centre, which cares for sick and abused elephants and holds the title of the world’s first elephant hospital. 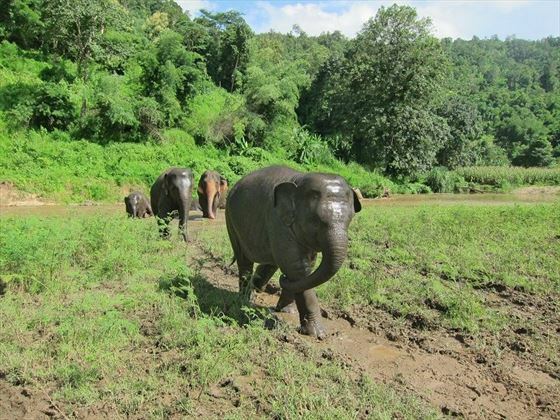 Learn about their conservation work and the challenges facing wild and domestic elephants in Thailand. You’ll also get to meet some of the resident patients before making the three-and-a-half-hour journey to Sukhothai. Sukhothai, which means ‘dawn of happiness’, is famous for its UNESCO-listed historic park stuffed with temples and ruins. 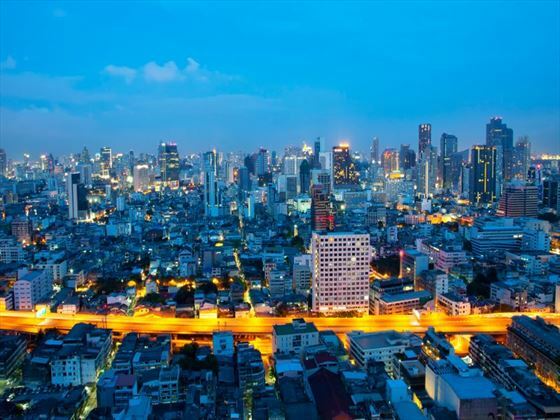 The city was established in the 13th century and is one of Thailand’s most historic sites. Tour the grounds by bicycle to learn about Sukhothai’s fascinating history and discover the remains of 21 archeological teasures set among gardens and lakes. Look out for religious art typical of that era, Buddha statues and ponds filled with lotus flowers. After the tour, you’ll enjoy a home-cooked picnic lunch. A private minibus will take you on the six-hour journey to Kanchanaburi, a town set in the beautiful Thai countryside surrounded by mountains, rivers and rice fields. There will be plenty of stops along the way, including at a local restaurant where you can have lunch. Upon arriving in Kanchanaburi, relax after the bus trip and take in your first views of the town, which is best known for its infamous Bridge over the River Kwai. Learn about Kanchanaburi’s moving WWII history and its Death Railway, so-called because an estimated 240,000 Asian labourers and allied prisoners of war died while constructing it. You’ll visit the excellent Hellfire Pass Memorial, one of the most difficult stretches of the Thai-Burma Railway where men were forced to cut through rock 18-metres deep. Often, they worked into the night by the light of ‘hellish’ fires, many dying in the process. Pay your respects at the Kanchanaburi War Cemetery and board the train at Nam Tok station to ride along the historic tracks of the original death railway. The journey will take you through spectacular countryside and across the Bridge over the River Kwai. After your day of exploring, relax in town at a riverside restaurant and take in views of the bridge illuminated by night. Take a three-hour private minivan back to Bangkok and spend the rest of the day as you please. Do some shopping, visit a museum or if you’re in the mood for temples, don’t miss Wat Pho, which houses a 46-metre-long golden reclining Buddha. In the evening, you’ll dine at a quirky themed restaurant: Cabbages and Condoms. This place is filled with creative condom-art, serves delicious Thai food and is designed to raise awareness for sexual health and family planning. There are no activities planned for the day and you can depart the accommodation at any time. If you have time to spare, take a final trip to Kaoh San Road for souveniers or have a relaxing traditional massage. Accommodation: four nights in a hotel, four nights in a resort, one night in a H’mong lodge, one night on a sleeper train. Transport: train, private minivan, longtail boat, songtheaw, bicycle. Food: 10 breakfasts, two lunches, three dinners. Activities: Grand Palace in Bangkok, Doi Suthep temple, Thai cooking class and Khantoke dinner and cultural show in Chiang Mai. H’mong Lodge meal and cultural show and trip to Friends of the Asian Elephant in Lampang. Sukhothai historical park bike tour and picnic lunch. The Kanchanaburi War Cemetery, Hellfire Pass Memorial Museum and historical train journey.